We are planning for new classes coming up, beginning in January 2019. The Adult Sunday School class will continue working through the book “Fearless,” our “What We Believe” new members class will continue, and a Parenting class is on the horizon, meeting in the Library (across the street). Stay tuned for details. 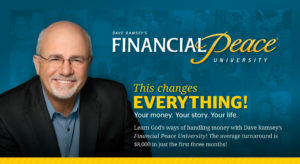 Starting Jan 30, 2019, we are running another session of Financial Peace University. Course fees are $99 for the 9 week bible study and all study materials. This includes an annual subscription to Dave Ramsey’s website and resources. Meeting on Wednesday nights from 6pm to 7:30pm. More info is available at the church office; please call 603-269-8831. Space is limited so please call now! Families with children in the Kids for Christ program (which runs concurrently) can enjoy a 20% tuition discount! !